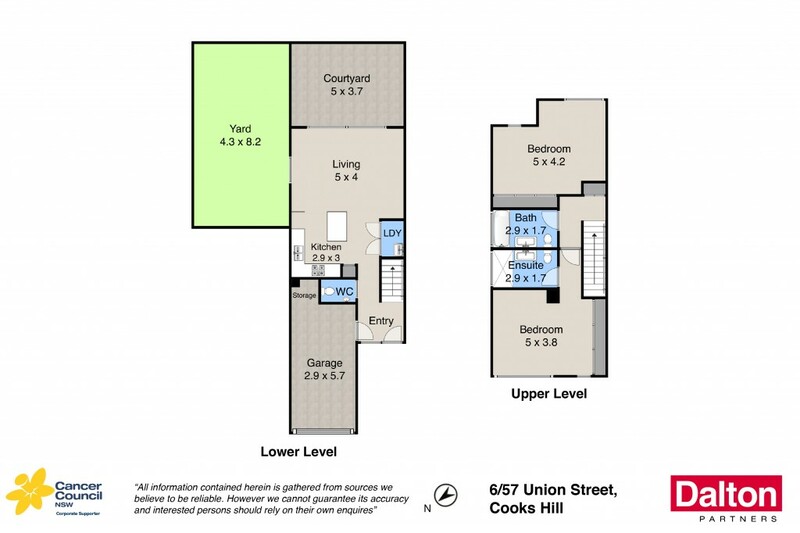 You will enjoy all the benefits that Cooks Hill can offer from this very affordable and unique Town home. Positioned in a quiet off street location set back from Union Street it provides easy walking access to the local pub scene, Aldi, Marketown shops, light rail and the wonder cafe lifestyle that Cooks Hill is synonymous for. A tiled open plan living area offers a modern kitchen with breakfast bar, sliding doors access a large paved and grassed courtyard measuring approx 65m2 in size with sunny aspect just perfect for entertaining. Upstairs offers 2 massive bedrooms comfortably allowing a formal study/2nd living or extra bedding when required. Two full size bathrooms, one being an ensuite are yet another special feature of this property. Ducted air conditioning and gas heating provide all year round comfort plus remote control garaging with internal access delivers the ideal 1st home, investment or low maintenance living alternative. Inspection sure to impress. * A quiet off street location enhances this very special town house. * Inviting living space viewing private paved and grass courtyard. * Remote control garage access to tiled entry and open plan living. * Huge bedrooms allowing study/additional bedding options. * 2 full size bathrooms enhance this affordable Cooks Hill abode. * Air conditioning, gas heating provides all year-round comfort. * Fantastic indoor/outdoor atmosphere, ideal for entertaining.